It's a party and you're invited! Click here to play! Help all of the fruit celebrate Lenny the Lemon's birthday and you could see yourself getting a few presents of your own! The Fruit Party logo is the biggest guest at this party. This symbol acts as a wild symbol and will replace most other symbols to help you spin in more wins. If you can get two to five of them across a pay line you'll get up to 2500 times your line bet. There are also plenty of other guests to help you celebrate. Spin three to five Owen the Orange to get up to 1000 times your line bet. 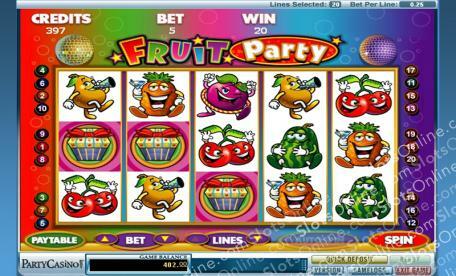 Shirley the Strawberry is in a festive mood and three to five of her will get you up to 1000 times your line bet. Wally the Watermelon also makes an appearance, bringing in up to 500 times your line bet. Also take a few spins on the dance floor with Polly the Plum, Pete the Pineapple, Bob the Banana, Percy the Pear, Grover the grape and Chrissy and Crystal the Cherry twins. As this is Lenny's birthday, he plays an extra special role. He acts as a scatter and will award you with multipliers and free spins if you can spin him three to five times anywhere on the board. It wouldn't be a party without presents! Spin these gifts to trigger a bonus feature that will see you gathering a few few of your own presents! Join the fruit in a celebration. Wish Lenny the Lemon a happy birthday and you'll bring in plenty of big wins! Lenny the Lemon acts as a scatter. Spin three to five of this little, yellow guy anywhere on the board and you will get up to 24 free spins and a multiplier that will multiply your prizes during your free spins. The Fruit Party logo will substitute for all other symbols, except scatters and bonuses, to help you create more winning combinations. Spin three or more presents on adjacent reels from the left most reel on which a pay line starts and you will trigger a bonus feature. During this game, you will get to choose from a selection of presents to reveal a your bonus prize!